Deviated nasal septum (DNS) is a common nasal problem all over the world. The incidence of a deviated septum rises with age. Coronal CT scan of PNS if functional endoscopic sinus surgery (FESS) is planned with septal surgery. Surgical treatment for patients with symptoms and gross deviation. 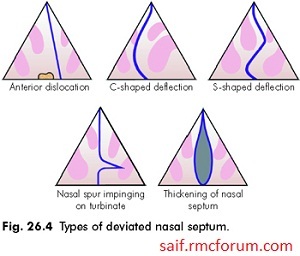 There are 2 surgical options for deviated nasal septum. Now septoplasy is mostly practiced as it has cosmetic value and can be done at any ages above 7 years, but SMR cannot be done in children below 14 years of age. Sir,what is the prognosis of Septoplasty? Prognosis of septoplasty is very good if done correctly. But improper correction may lead to recurrence. Dr M A Matin DLO ( London ) FRCS ( England ) FRCS ( Glasgow ) FRCS ( Edinburgh ) Head of the Department of ENT & HNS Rajshahi medical college. Sir, Thanks a lot for your valuable comments here.